Many years ago, I would have had little interest in this CD. I maintained a healthy dislike of paraphrases, transcriptions and fantasies of any music, whether symphonic or operatic. But one day, I read how the genre developed. Back in the nineteenth century, not everyone could afford the time and expense of visiting the cultural centres of Europe. At the same time, there were few provincial orchestras. But what did exist was the grand piano. As the century progressed, this instrument was found in a greater number of houses and institutions. It was possible to hold recitals in the remotest parts of the country and for music-lovers to turn up to hear the famous virtuosos play original pieces and reworkings of the classics. Take Liszt for example. He made transcriptions of, for example, Beethoven’s Symphonies, Berlioz’s Symphonie Fantastique and Hummel’s Septet. These arrangements could be played at any venue and would enable provincial audiences to hear works denied to them by time, money and social standing. If it was prohibitively expensive to promote an orchestral concert, how much more so was it to stage an opera. One cannot imagine many performances of Wagner’s Rienzi or Verdi’s Il Trovatore in Rochdale, Lyme Regis or Ryde, Isle of Wight in those days. Yet Liszt visited these three places and many more on his tours of the United Kingdom. It was an opportunity to hear the ‘famous’ tunes re-presented. So, I changed my mind, and now enjoy and appreciate this genre. It is not the place to define a concert paraphrase and its cognates (transcription, arrangement, fantasia, réminiscences etc); they all tend to shade into each other. However, as a rule of thumb it can be regarded as a composer taking an opera (or similar) and using extracts, often the ‘best bits’, to build a new composition. Frequently, it is a string of pearls with emphasis placed on the tunes rather than subjecting a theme to development. Free forms are often used, although it is possible to utilise a rondo or modified sonata or cyclic forms. If the composer is a piano virtuoso (and most that contributed to this genre were) they will include horrendously difficult technical passages, ‘update’ the harmonies and generally make the work spectacular and jolly difficult. The catalogues of piano music contain many composers who produced ‘Operatic Transcriptions’: these include Franz Liszt, Moritz Moszkowski, Carl Tausig, Percy Grainger, Sigismond Thalberg, Louis Brassin and Paul Pabst. The CD opens with Alfred Jaëll’s romantically conceived ‘Réminiscences de Norma’, op.20 based on Vincenzo Bellini’s famous opera. It has been compared to the better-known work by Liszt, but Jaëll also includes the beautiful aria ‘Casta diva’ which was omitted by the Hungarian. The first piece that the present soloist Andrew Wright has transcribed for this disc is ‘Col sorriso d'innocenza’ from Bellini’s Il Pirata. This opera was composed in 1826. Wright has produced more of an arrangement here, keeping to a literal interpretation of the score which is restrained and quite beautiful. Sigismond Thalberg is one of the ‘big names’ in the world of operatic transcriptions. His catalogue is full of Fantasies and Grande Fantasies on a wide range of operas and other musical works. The present piece, Fantasie sur Mosè in Egitto, after Gioachino Rossini is massive in its construction and effect. There are horrendously complex pianistic configurations including fiendish octave passages, ‘sweeping arpeggios’ and extremely fast chromatic melodic patterns. I followed this piece with the score: it is utterly amazing! The second of Andrew Wright’s contributions to the genre is his paraphrase on Giuseppe Verdi’s ‘Miserere’ from Il Trovatore (1853). Wright has enumerated the technical devices used: “subsequent thematic material is liberally embellished with tremolandi, arpeggios, trills, passages in thirds, and interlocking alternate hand chords and octaves”: he has used all the appurtenances of Liszt and Thalberg, such as heavy bass chords to imitate the tolling of bells and a hugely difficult ‘moto perpetuo’ in conclusion. It is a stunning addition to the ‘paraphrase’ genre. Theodor Kullak’s Cavatine de Robert le Diable, is one of a collection of a dozen operatic transcriptions, op.6. The liner notes remind the listener that “Meyerbeer's Robert le Diable was one of the huge Parisian operatic successes of the1830s…” and that it is hardly surprising that more than one piano virtuoso decided to use its material in transcriptions and arrangements. These virtuosos included Franz Liszt, Adolf von Henselt, Johann Peter Pixis and Sigismond Thalberg. Kullak is best recalled for his pedagogical works such as The School of Octave Playing. Recent years have seen Hyperion release his Piano Concerto in C minor, op.55. The present Cavatina is a worthy transcription that does great service to the original music. The pianist on this disc, Adrian Wright has repristinated the genre of the Operatic Paraphrase. In his biographical note, it is pointed out that he “acquired the conviction that much of the conventional repertoire is overexposed, and that there are many hidden gems to be found in the works of lesser-known composers”. Based on this opinion, Wright has made a considerable study of music composed by ‘minor’ figures from the late 19th and early 20th century. Wright’s playing is superb. The sound quality of the recording is ideally balanced: every detail from the most intimate arabesque to the hammered octaves is clear and undistorted. The liner notes are written by the pianist and are detailed, interesting and informative: I have relied heavily on them in this review, especially as some of these pieces are virtually unknown. Interestingly, more than half of these ‘paraphrases’ are receiving their “first commercial recording”. I would recommend not listening to this CD from end to end. The style of these pieces can be overwhelming. I suggest savouring one or two at a time. Finally, I have never been a huge enthusiast of opera. I reach my limit of enjoyment with Franz Lehar and Gilbert and Sullivan. However, I love many of the famous tunes from the works by the operatic masters. 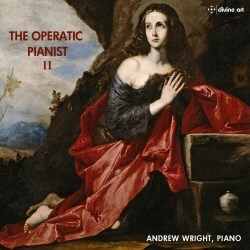 Adrian Wright’s The Operatic Pianist is the way I like to hear my opera ‘dished up.’.